Conrad Hammett was born in Wilton, Wiltshire, in 1892, the only child of groom and stockman Albert Daniel Hammett and Mary Ann née Seaborn. In the 1901 census Mary and Conrad were living in Wilton while 40-year old Albert was a patient in a nursing home at 2 Wetherall Place, Clifton, Bristol. As a sidenote, Albert's father, James Hammett (b1818), was cousin to the Tolpuddle Martyr of the same name (many thanks to Wendy Lawrence for this snippet). By the time of the 1911 census Albert and Mary, together with Conrad, were living at 100 Huish. Alfred listed his occupation as a Porter in a Carriage Works, probably at Hill & Boll, while Conrad was a Cabinet Maker working at Jesty & Co in Middle Street. By 1916 Albert and Mary were living at 9 Sparrow Lane (today's Sparrow Road). In November 1913 Conrad enlisted in the Regular Army at Cheltenham, Gloucestershire. 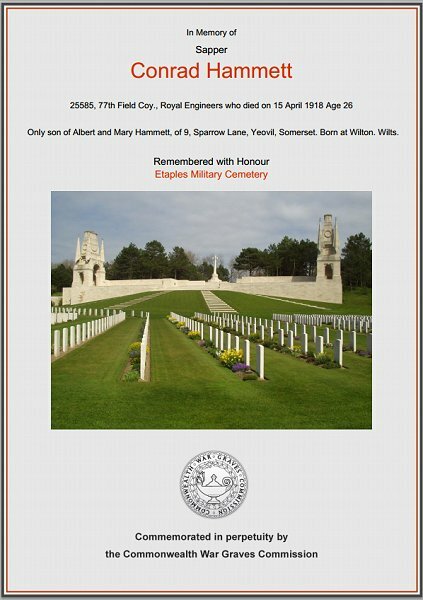 He became a Sapper (Serial No 25585) in the Royal Engineers. When the expansion of the army was sanctioned in August 1914, it required four Armies each of six Divisions to have two Field Companies each; that is, 48 new Field Companies. 77th Field Company was a company created in 17th (Northern) Division of the Second New Army. Conrad was transferred to this 77th Field Company. After receiving an order that the Division would be retained for home defence (subsequently cancelled), advance parties left for France on 6 July. Main embarkation began on 12 July and units moved to concentrate near St Omer. The Division served on the Western Front for the remainder of the war, taking part in many of the significant actions. The Royal Engineers carried out a number of different roles for the army both in the battlefield and along the lines of communication. The various specialisms were organised into different types of units, none of which was bigger than a Company in size. These units were attached to Divisions, or to larger formations at Corps, Army or even GHQ. The most numerous of the Royal Engineer units, the Field Companies provided the technical expertise at the front-lines. As they were attached to the fighting portions of the Divisions, these Companies often saw action and took part in the fighting. It is not possible to tell in which battles the 77th Field Company took part but during 1915 the 17th Division spent its initial period of trench familiarisation and then holding the front lines in the southern area of the Ypres salient. During 1916 the 17th Division was involved in fighting at the Bluff (south east of Ypres on the Comines canal), part of a number of engagements officially known as the Actions of Spring 1916. "The Bluff", was an artificial ridge in the landscape created by spoil from failed attempts to dig the Ypres-Comines canal. With the additional height in an otherwise relatively flat landscape, The Bluff was an important military objective. German forces took The Bluff in February 1916, and it was recaptured by the British on 2 March although sporadic fighting continued. The British Official History, which made a painstaking compilation of casualty statistics, quotes a total of 177,739 men of Britain and the Commonwealth lost as killed, wounded and missing in this last battle. Of these, just under 15,000 died. Of the 90,000 quoted as missing, a very large proportion were taken prisoner as the Germans advanced. For the same reason, an unusually high proportion of those who died have no known grave. It was during the Battle of Bapaume that Conrad was shot in the leg on 25 March 1918 near Courcelette, close to Albert, and was evacuated to the General Hospital at Etaples, in the Pas de Calais, France, where he died of his wound on 15 April 1916. He was aged 25. On 26 April 1918, the Western Gazette reported "Mr and Mrs AD Hammett, of 9 Sparrow Road, have lost their only son, Sapper C Hammett, who died in a hospital in France on the 15th inst. The deceased, who has a record of three year’s unbroken service in France, received a gunshot wound in the thigh the latter part of last month, to which he succumbed on April 15th. The late sapper, who is only 25 years of age, enlisted in the regular Army in November 1913, and served his apprenticeship at Messrs. Jesty & Co., Middle Street. He only returned from 14 days furlough on March 2nd." 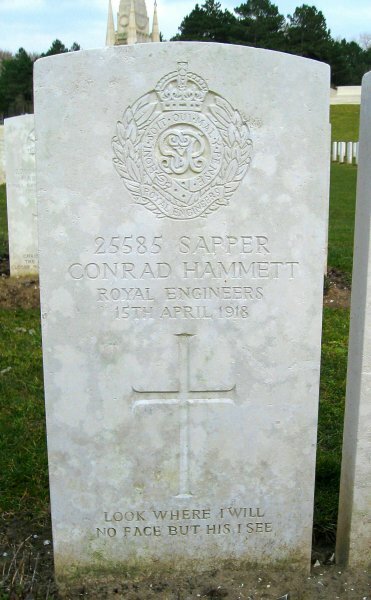 Conrad Hammett was interred in Etaples Military Cemetery, Grave XXIX.B.21, and his name is recorded on the War Memorial in the Borough. The Commonwealth War Graves Commission certificate in memory of Conrad Hammett.